In this Friday, June 24, 2016, file photo, pedestrians and tourists go about their lunchtime routine in front of the United States Treasury headquarters building in Washington. On Wednesday, May 10, 2017, the Treasury Department releases federal budget data for April. The federal government ran the second highest monthly surplus on record this April as tax revenues were pushed higher by a change in the deadline for corporate tax payments. 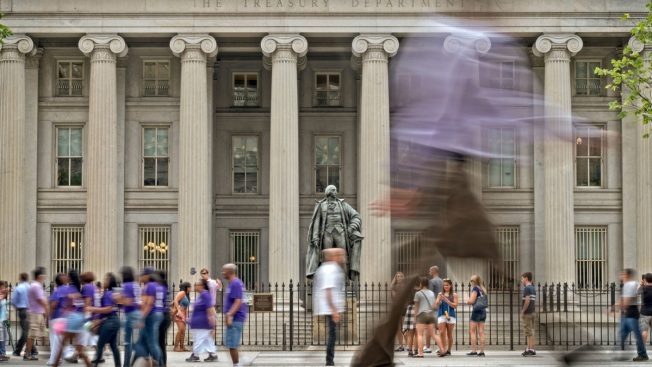 In its monthly budget report, the Treasury Department said Wednesday that the surplus for April totaled $182.4 billion, the second largest surplus after a record $189.8 billion surplus set in April 2001. The government generally runs surpluses in April reflecting the annual tax deadlines. This year's surplus was inflated because of a deadline change that allowed corporations until April to make their final tax payments for last year. The deadline had previously been March. Through the first seven months of the current budget year, the government is running a deficit of $344.4 billion, down 2.4 percent from the same period a year ago. The Congressional Budget Office is projecting that the deficit for the full budget year, which ends on Sept. 30, will decline 4.6 percent to $559 billion. That would compare to a 2016 deficit of $585.6 billion. The CBO's deficit estimate is based on current law remaining unchanged. President Donald Trump has called for a program of tax cuts for individuals and businesses, and increased government spending in such areas as the military and repairing the nation's aging infrastructure. The CBO has not been able to project how much impact Trump's proposals will have on this year's deficit or in future years because so far the administration has not released its full budget outline. That document is expected to come out later this month. For the first seven months of this, revenues total $1.93 trillion, up 0.6 percent from the same period a year ago. Spending totals $2.27 trillion, up 0.2 percent from the same period last year.